Chocolate Easter Eggs Have Hatched at Blair Candy! We couldn’t be hippity-hoppity-happier that Easter is well on its way! 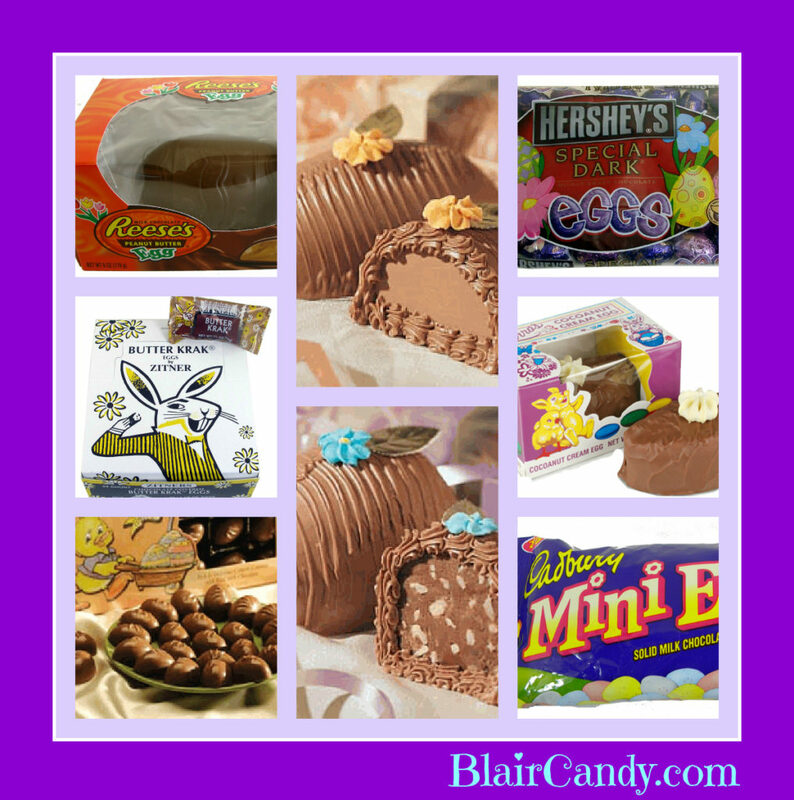 Here at BlairCandy.com, we’re always sure to stock a superior selection of Easter candy. You can count on us for the freshest jelly beans, marshmallow Peeps, chocolate bunnies, and other mouthwatering must-haves. But it’s the most decidedly Easter-y candy of all that gets our taste buds talking loudest – chocolate Easter eggs! The world of chocolate Easter eggs offers something special for everyone’s preferences. If you like them on the little side, Cadbury Mini Eggs make an addictive option. I actually count them among my Top 5 favorite chocolate candies of all time, and wish they were available year-round! A perfectly petite egg of chocolate is dressed in a sweet, slightly speckled, pastel candy shell, and the result is simple, velvety perfection with a touch of texture. When I’m craving something a little larger with a bit more crunch, I reach for Zitner’s Butter Krak Eggs. If you’ve never had the pleasure of sinking your teeth into one of these marvelous creations, don’t waste any more time! They’re buttery, coconutty, and wrapped in divine dark chocolate decadence. You might just want to put a few on a plate and call it dinner! Candy Goes Green – For St. Patrick’s Day, that is! As the shelves full of pink and red Valentine’s Day candy get smaller and shorter with each passing day, the team here at Blair is preparing for the next holiday on the candy horizon. We don’t let ourselves get too teary when one holiday passes, as there’s always another hot on its heels! And in this case, as the romance of Valentine’s Day slips away, the luck of St. Patrick’s Day candy whirls in. Not a shabby trade – especially if you get both and you’re lucky in love! Finding the perfect candy for St. Patty’s Day is as simple as going for the green and gold. Luckily, those two colors often yield some pretty tasty treats, many of which are also super cute to boot! We put together a list of our Top 3 St. Patrick’s Day Candy Must-Haves. Do you agree with our list? What might you add to the lineup? #1) Chocolate Coins – It doesn’t seem to matter how old I get – gold chocolate coins never lose their cool! With 2 lbs. in each bag – approximately 150 coins – you’ll have plenty to fill a candy bowl with treasure, pass them out at parades or parties, or even invest in a little black pot to keep them in like an end-of-the-rainbow decoration. And, naturally, they’re good for eating as well! #2) Bubble Gum Coins – An even more affordable way to enjoy the fun factor of coin candy, green foil-wrapped bubble gum coins make a wonderful complement to our gold chocolate coins. With roughly 100 to a bag, you can pop your way to St. Patrick’s Day! #3) Gold Mine Gum – While most of us will never get the chance to call a genuine bag of gold our own, Gold Mine Nugget Bubble Gum lets us dream! It also lets us enjoy a fresh, fruity taste all wrapped up in a cute cloth pouch that beats a paper package any day of the week.